In hindsight, the first sign that things were actually going to be different for Nebraska’s offense in 2018 may have been the Huskers’ seventh play of the season. 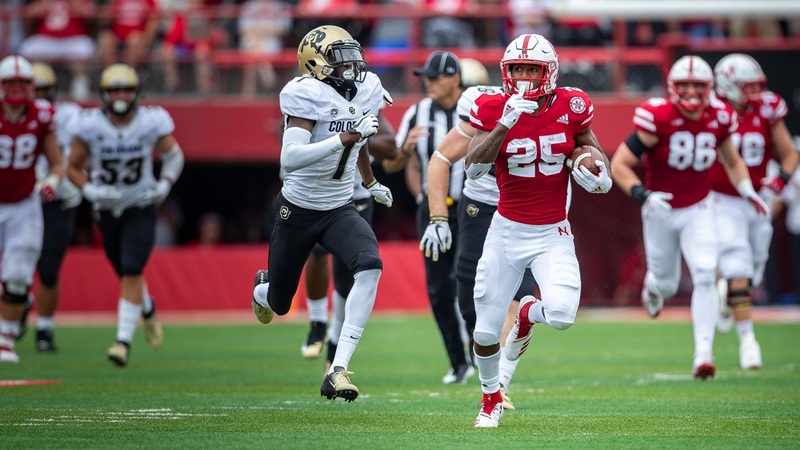 Nebraska had run on five of the first six plays, moving to Colorado’s 26-yard line where the Huskers faced a second-and-7. Scott Frost called running back Greg Bell’s number again, his fourth carry of the drive, and the play resulted in 3 yards. Bell would fumble on the next play, but for this discussion we’re interested in that 3-yard run that nobody thought twice about. It stands out for what it said about what was to come on Saturday. It was a run on a “passing down.” The latter isn’t a random designation, but it comes from Football Outsider’s success rate thresholds. Any first down, second-and-6 or fewer, third- and fourth-and-4 or fewer is a standard down; anything else is a passing down. As the names are telling you, it’s a big advantage for a team to stay in standard downs. The average success rate on standard downs in 2017 was 46.5 percent, and it dropped to 30.7 percent on passing downs for the obvious reason –– defense has the leverage in that situation of knowing what the offense is likely to do to get back on schedule. Most teams will pass. That was especially true of Mike Riley-era Nebraska. When those Husker teams were in passing downs they ran the ball 25.2 percent of the time in 2017 (116th nationally), 28.4 percent in 2016 (102nd) and 26.7 percent in 2015 (104th). That’s pretty predictable. When the defense had the Huskers behind the chains, Nebraska’s offense did what the opponent could’ve reasonably expected about 75 percent of the time. That’s why passing downs are important to a defense (and important for an offense to avoid). But if a coach has some confidence in his offense, or maybe just a rebellious streak, it doesn’t have to be so simple. Against Colorado last week Nebraska ran the ball on passing downs 37.5 percent of the time. That’s a pretty average run rate on passing downs year to year, but it’s huge jump from where this offense was the previous three seasons. And it might’ve been even more stark if the Huskers didn’t fall behind at the end. Five of Nebraska’s 24 passing downs in the game came on the last, Andrew Bunch-led drive when the Huskers had to have a touchdown in the final minute. Prior to that point, however, Nebraska had run on 9-of-19 passing downs (47.4 percent). These plays were rarely successful based on the success-rate thresholds –– an offense has to gain 70 percent of the yards remaining on a second down, for example, for it to be a “success” –– but they were often setting up more manageable downs to follow. This will be an interesting area to watch as the Huskers’ season progresses. There can be value in being contrarian when it comes to play calling, unpredictable in the most predictable of situations, but it takes confidence in the players and plays. Frost came out of the gate displaying a good deal of that. According to a report from BuffZone.com, no CU player will face a suspension from the play that injured Adrian Martinez, which Nebraska submitted for review to the respective conferences. Man, Boise State destroyed UConn last weekend. I never bothered to look at this box score, but it's a horror film for Huskie fans. Minnesota starting running back Rodney Smith is out for the rest of the season after injuring his knee. Nebraska's Mikaela Foecke was named the Co-Big Ten Player of the Week. ICYMI: Defensive coordinator Erik Chinander might be a wizard, John Cook on parity in college volleyball, catching up with 2019 commit Jackson Hannah, Mohamed Barry continues to give great quotes and (some of) the Blackshirts are here.